Aiden at the lifestyle block of Pixie and Robin Moss, his former New Zealand employers, during his recent visit to New Zealand for the Pasture Summit study tour. Photo: Catherine Fry. It would be safe to say that American-born Irishman Aiden Cunningham had a rather nomadic childhood. His mother was born in New Jersey, United States, but spent much of her childhood in Donegal, Ireland, before returning to New Jersey aged 16. His father was born on an Irish farm, and had immigrated to the US at age 20. Aiden, now aged 28, was born in New Jersey, but from the age of two to six lived a suburban life in Kildare, Ireland. From age six to 18 he lived in New Jersey, and has fond memories of spending summers working on his grandparents 70-cow dairy farm. While looking for a summer farm job in Ireland, he stumbled upon a farm assistant vacancy in the Waikato in New Zealand. After applying online, and conducting phone interviews with farm owners Pixie and Robin Moss, Aiden, then aged 20 had a job offer. He booked a one-way flight to NZ and had four weeks to earn enough money to pay for it. “I arrived in NZ on the May 17, 2010. Little did Pixie and Robin know they were basically going to end up with another son for a few years,” says Aiden. 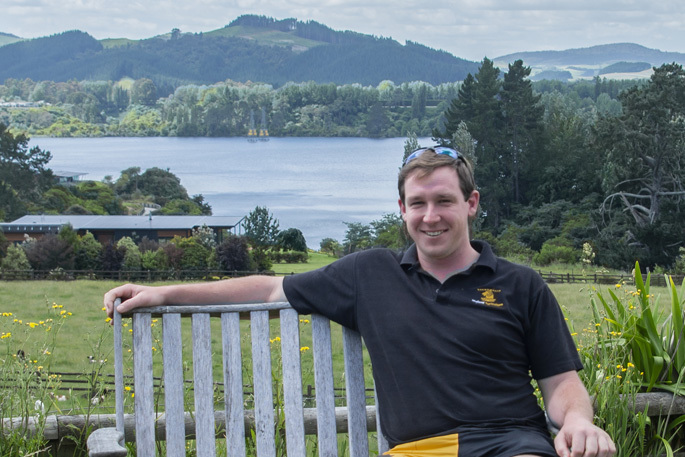 While living in the Waikato, Aiden looked at doing his AgScience degree at Massey. The university fought a case for him and he paid “a handsome fee” to be an international student there. At the end of his degree, the wanderlust hadn’t gone from Aiden yet – he wanted to travel a bit more before settling and sharemilking in New Zealand. Aiden was interviewed in Ashburton, by Jim van der Poel, a stakeholder in Focal Dairies, a pasture-based dairy farming pioneer enterprise in Missouri, US. This completely Kiwi-owned farm in Missouri was to be Aiden’s home for two years. He supervised the farming operation at Kitten Creek Dairy in Harwood, developing and implementing day-to-day management policies. The 1500ha property had 1500 Friesian-cross cows from Kiwi genetics, milked twice-a-day in a 50-unit rotary shed. Milk was picked up once-a-day by a tanker for Dairy Farmers of America. While cows there are pretty robust, the climate had the biggest impact on people and their daily workload. With temperatures dropping into the minus 20 degrees Celsius range and below during a cold, dry winter, keeping the milking shed from freezing was a priority. It was enclosed and diesel-fuelled heaters were left on overnight during the coldest times. And with cows starting to dry off from November, ready for February calving, in such cold temperatures during calving 24-hour checks were made on the paddocks, bringing calves inside as soon as they were born and feeding them high quality colostrum within one hour. And Missouri’s hot, humid summers posed different challenges – the farm has sprinkler systems and fans in sheds. A 1500-cow covered feed pad, shelterbelts and stands of trees are used to keep cows shaded. The pastures are the French-developed Albion perennial ryegrass, which copes well with hot/dry and hot/humid conditions. In winter it goes dormant – but the almost freeze-dried plant is still nutritious for cows. Plus supplements such as maize, silage, cotton seed and soy bean meal are used. Aiden returned to Ireland in 2016 and has been involved in a dairy conversion project in Kilkenny, project managing the amalgamation of three farms. He has a 10 per cent investment in the 500-cow herd, and some heifers himself, with 117 cows due to calve in the Irish spring. “I’m really aware that at my age and stage in life I should be building wealth to further my dairy farming career. “But lifestyle is also important and coming back to NZ for the recent Pasture Summit Focus Study Tour reminded me of that. Whether it is Ireland, the US, NZ, or somewhere new, this well-travelled, hardworking and enthusiastic young man is sure to make a success of his next venture.